The Lake Forest Association (LFA) is an organization formed in 1960 to maintain, develop and control the property known as Eastwood Lake and the LFA Park located on South Lakeshore Drive. Any person or group of persons who own one or more lots in Lake Forest Estates is be a member of this corporation. Membership comes in several forms, the most common of which is Participating Members who are current on all LFA dues payments. Participating members support the ongoing maintenance of Eastwood Lake and the LFA park and members enjoy access to the LFA Park and its amenities. Non-participating Members are members of the LFA, but are not current on dues payments and according to the association's by-laws, shall have no right to vote on corporation matters or to hold office in the corporation, and shall have no right to use the corporation’s property. In 1995, and renewed in 2003 by a vote of the general membership, the Associate Member program invites property owners of specific homes in proximity to LFA Member homes to join as Associate Members. These members may access the LFA Park and utilize its amenities, and according to LFA bylaws, an Associate Member may serve on committees and participate in discussions at general meetings but are not entitled to vote. Associate Members may serve on the LFA Board, and one Associate Member is currently doing so. For more information about Associate Membership, click here. The map below highlights the properties which are a part of the LFA and properties currently eligible for associate membership. 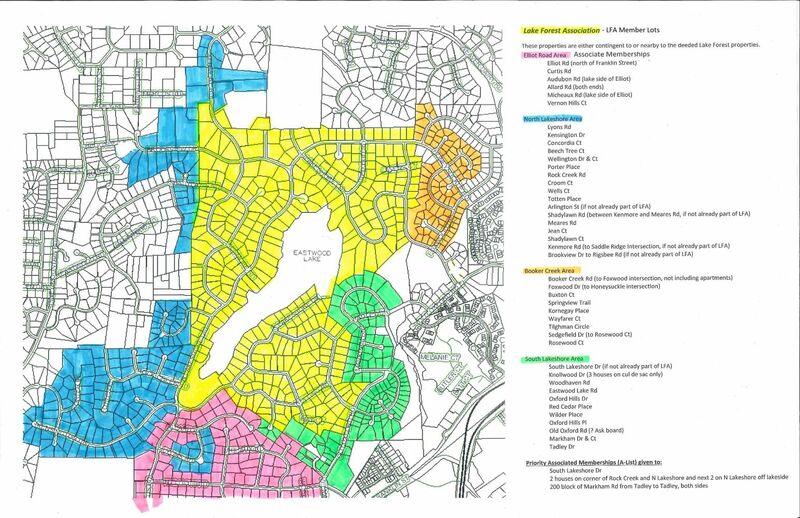 Properties in Lake Forest Estates and are therefore LFA member properties are highlighted in yellow. Lots highlighted in other colors are homes which may be eligible for Associate Membership. For all questions related to LFA membership, please Contact Us.